Vietnam offers some wonderful treks, allowing you to spend days walking through dense rainforests, spotting spectacular wildlife, learning about the cultures of the many different tribes who live in the remoter areas, and often staying with them in their homes and sharing their meals. ¾ of the territories of Vietnam covered by mountains and jungles with many untouched place by the tourist, authentic villages, hospitable local people and great scenery as well as nature. Hereunder I would like to share with you some information and ideas for trekking in Vietnam. 1. Trek duration: Trekking in Vietnam can be very flexible in term of duration. It can be from few hours to few days for some of short trekking tour or sometime it can be from one to few weeks. National Park: very ideal places for trekking as they have beautiful nature and scenery as well as very trekking routes. If you like to trek in this kind of destination, you can be in Cat Ba, Ba Be, Pu Luong, Xuan Son, Cuc Phuong National Park in the North, Bach Ma National Park in the Central or Cat Tien National Park in the South of Vietnam. 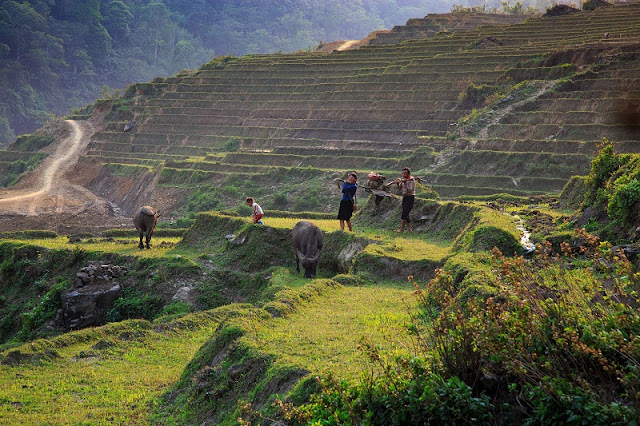 Beautiful mountain area that you can trek and visit local villages as well as integrate to local people: This is one of the most popular trekking activities in Vietnam. Some of the popular places can be in Sapa, Bac Ha, Mai Chau, Tam Duong, Cao Bang, Ha Giang… in the North, in Chay Lap in the central or in Central Highland and Da Lat in the South of Vietnam. This is a great way to discover local places, enjoy beautiful scenery, meeting people as well as having very good physic activities during the trek. In many stops, you will stay overnight in the house of local people and this can be one of the highlight of the trip. Some of the summits in Vietnam for conquering: The most amazing one for this activities in Fansipan – the top of Indochina with the elevation of 3143m from sea level. It is the big challenge and dream of any Vietnamese people to climb up there. The shortest time to conquer this summit is in 3 days from Sapa town. The other uprising destination is Tay Con Linh, the amazing mountain in Ha Giang. 3. Trek time: The best time for trekking in Vietnam is from October to March, when the weather is cool and it is in dry seasons.